Studio units are spacious and comfortable, suitable for the single traveller, twin share or triple share. Kitchens facilities include: gas cooktops, microwaves, electric frying pans, tea & coffee facilities, toaster. Relax on the balconies with spectacular views to Mt Pitt Rainforest. Spacious and comfortable, fully self contained with full kitchen facilities. Suitable for Single, Twin or Triple share. 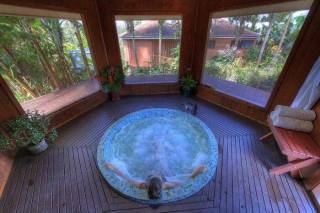 Enjoy the peaceful subtropical garden surrounds and scenic view to Mt Pitt Rainforest. Perfect for couples wanting a peaceful escape. This two bedroom cottage is spacious and comfortable, fully self contained with full kitchen facilities and two bathrooms. Suitable for Single, Twin, Triple or Quad share. 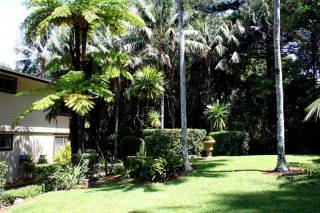 Enjoy the peaceful subtropical garden surrounds and scenic views to Mt Pitt rainforest. Perfect for couples, or small groups wanting a peaceful escape. At The Polynesian Apartments, we have a variety of packages available, from Room only, Breakfast packages or design your own, you are sure to find one to fit your perfect holiday. 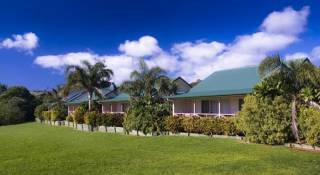 Our prime central location makes The Polynesian Apartments your ideal Norfolk Island accommodation. Just 200m from the roundabout and the heart of the Burnt Pine Shopping Centre we are the ultimate in convenience. Built by the current owner and still in the family after 40 years of dedicated friendly service, The Polynesian offers comfortable, spacious and clean studios, recently upgraded to self-contained status with new modern kitchens, and fabulous views over the Mt Pitt National Park, as well as a separate cottage comprising of a 1BR apartment and studio which opens to a 2BR apartment with two kitchens and two bathrooms. We represent great value for money, providing everything you need for a comfortable holiday, at a great low price leaving you extra to spend on the more important things, like more magnificent tours, romantic dining, shopping or a little pampering. We provide a good standard of accommodation and facilities, we follow a regular upgrade program to keep in line with the AAA grading requirements, and our emphasis above all is on cleanliness and great friendly service with those little extras like seasonal fruit from the family farm. Come see for yourself and be surprised. Choose from studio units, one or two bedroom apartments depending on your needs and budget. One and Two Bedroom apartments are spacious and comfortable, fully self contained with full kitchen facilities. Suitable for Single, Twin or Triple share,and Quad share in the two bedroom. Enjoy the peaceful subtropical garden surrounds. Perfect for couples, or small groups wanting a peaceful escape. We have prime location on New Cascade Road, just 200 m from the roundabout and the heart of the Burnt Pine shopping centre, the ultimate in convenience. An easy level walk even for elderly visitors , or wheelchair access to the shops, bowling club, cafes, tour offices and car hire companies. The Tast of Asia Restaurant and Takeaway: our licensed restaurant is open 6 nights a week Monday to Saturday from 6pm. Choose from a range or Asian Cuisines that will delight your senses. Norfolk Island has an abundance of perfect picnic spots, from dramatic cliff tops to secluded National Park escapes. Make use of our free thermos and eskies for your convenience. ​Experience Norfolk Island's beautiful National Parks with bushwalks for all levels of experience. Centrally located, The Polynesian Apartments are the perfect base, enjoy your walk then come back and relax in the pool or spa. 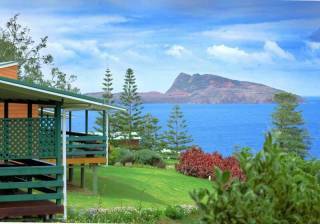 Just approx 100m from the Norfolk Island Bowling Club, enjoy a social game, or a meal in the club. Don't worry, we are so close you can walk home, so you can enjoy a drink or two.